It is difficult to say anything more complimentary about this critically acclaimed and award winning set that has not already been said. Superlatives abound and rightly so! Recorded in 2002 the artists here breathe life and a sense of adventure into this music. Incidentally the booklet notes give no credit to a conductor so one might assume that the ensemble direct themselves. Polish-based Arte Dei Suonatori are one of several outstanding specialist period instrument ensembles that have come to prominence on the early music scene in the last ten or so years. They have successfully ratcheted-up the level of technical proficiency and interpretation by several notches. Undoubtedly the earlier pioneering interpretations of Vivaldi and Baroque music in general using period-instruments were dictated by the severe limitations of their instruments. Consequently the performance style often came across as technically mechanical, rather lacklustre, frequently insipid and even sterile. These days the players explore and exploit the strength of their period instruments rather than being restricted by the weaknesses. Other notable specialist period instrument ensembles in this type of repertoire include: Concerto Italiano under Rinaldo Alessandrini; the Venice Baroque Orchestra under Andrea Marcon; Europa Galante under Fabio Biondi; The English Concert under Andrew Manze; Ensemble Explorations under Roel Dieltiens; and the Freiburger Barockorchester under Gottfried von der Goltz. Rachel Podger uses a baroque violin made by Pesarinius from 1739 and her performance reaches a supreme solidarity with Arte Dei Suonatori. Her playing can swing effortlessly from exciting and powerful to sensitive and poignant, yet constantly remaining stylish and polished. These are intensely committed, ardently expressive and exhilarating accounts. The violin concertos of La Stravaganza are remarkable for their range of colouration as the Vivaldi discards several vestiges of Corellian influence and reaches out with his own distinct style. Rachel Podger states how impressed she is with Vivaldi�s seemingly endless capacity for invention and remarkable melodic figurations. 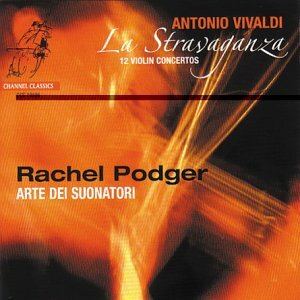 In La Stravaganza Vivaldi has achieved a remarkably high level of consistency and artistic quality from a real exhilaration in the allegros to a deep emotion in the central slow movements. I would single out the splendid concerto in F major, No. 9 as my favourite work. The foot-tapping and trotting pace of the opening movement allegro is infectious. In the central slow movement the somewhat mellifluous yet agitated solo violin against a gentle rocking rhythm is most appealing and the work concludes with a striking and furiously paced allegro. My favourite movement just has to be the meltingly beautiful largo from the concerto in D major, No. 11 which is simply irresistible and is a candidate for one of Vivaldi�s greatest hits. There have not been too many versions of La Stravaganza recorded over the years and consequently the Opus 4 set has remained in the shadow of other published collections such as L�Estro armonico Op.3, Il Cimento dell�armonia e dell�inventione, Op. 8 and La Cetra, Op.9. However the sets from Neville Marriner directing the Academy of St. Martin-in-the-Fields on Decca 444821 and Christopher Hogwood directing the Academy of Ancient Music on L'Oiseau Lyre 417-502 were recorded some years ago now and have, I believe, been in and out of the catalogues. These new accounts make the versions from Marriner and Hogwood seem pale, rather lacklustre and somewhat academic and mechanical by comparison. The sound engineers at Channel Classics have provided a top-class sound quality and the annotation is excellent too. A marvellously presented release. No praise is high enough for these performances!